November 4, 2017, Wakefield MA – By Linda Desjardins and Mike Pelletier. Seven Striders were there for the Run For All Ages challenge, and the race’s name is quite appropriate. Organized by the New England 65+ Club, this flat and fast 5K features 5-year age groups from age 60 to 100 in addition to the usual 10-year age groups for younger runners. A six year old girl ran and so did a 92 year old man. Both earned medals. The race results include both actual gun and run times and also age-graded times which is a double edged sword: it can be an ego booster for those of us in the upper echelons of age as our slowing times are not as bad as they may seem. On the other hand, it is quite humbling to see others of advanced age run times we couldn’t run even when we were in the open age groups. And this race is a magnet for speedy vets! To illustrate this point, Linda Desjardins was 7th/16 in her 65-69 age group. And her 9:25 was respectable enough. But she would’ve taken 3rd with her time in the 60-64 age group and would’ve won the 70-74 age group were she six weeks older. Watch out for those veteran speedsters! The weather was ideal and the course, around the perimeter of Lake Quannapowitt, makes for a very scenic route. And nicely flat and fast. Striders earned medals with some outstanding times. Kate Gage, our first finisher in 22:00 took an age group second and that time put her in the 69th percentile when age adjusted. Next was Lauren Hamilton with a 22:10, also earning an age group second and age adjusted 77th percentile. Mike Pelletier crossed next in a 27:35, landing in 4th place in the age group, only 7 seconds out of 3rd, but earning a Silver in the Massachusetts Senior Games category of this race. His age adjusted run was in the 68th percentile. After Mike, Cheryl Welsh, nursing a sore hamstring but running well despite it, came across in 28:54, representing a 63rd percentile finish. About a minute later, Linda Desjardins tapped that finish mat in 29:44, reaching her “under 30 minutes” goal. Her time got her in the 70th percentile. Armand Claveau despite a dearth of recent training came in at 41:46 and that time put him in the 45th percentile. Jenny Reynolds, not being stopped by her aching back (receiving physical therapy), decided to walk the 5K and still came in 45:35. What a trooper! What are age-graded results? Basically it compares runners of the exact same age (think of a single-year age group of 40 and over) with the world standard for that age and gender. Note that you have to be at least 40 to receive an age-graded percentage or time. As an example, Lauren Hamilton ran the 5K in 22:10. Her Age-Graded time for 5K would be 19:12. This means that in her prime (typically 19 to 29 years-old) Lauren would have run a time of 19:12 for a 5K. Lauren’s age-graded percent was 77%. Which means her time was 77% of the standard, the standard being the world’s best time for a 5K by a woman of her age. Note: there are lots of pictures of this race available for free. 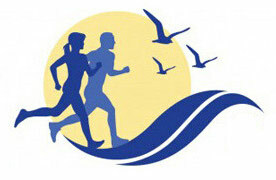 Go to the Results for November 4 on Coolrunning and select the Run for All Ages. Then on the upper left, click on Photos by Jim Rhoads for page after page of photos of race. Everyone is pictured at least twice: at the beginning and at the finish of the race.